WASHINGTON (Jan. 13, 2012) -- Probably by this summer, the Army will be floating a new idea past the troops for intelligence, surveillance and reconnaissance. Not a program of record, but something the Army expects to test in Afghanistan this summer, the Long Endurance Multi-Intelligence Vehicle. It's a hybrid air vehicle -- like a blimp -- that can carry multiple intelligence, surveillance and reconnaissance, known as ISR, payloads for more than 21 days at altitudes greater than 22,000 feet. 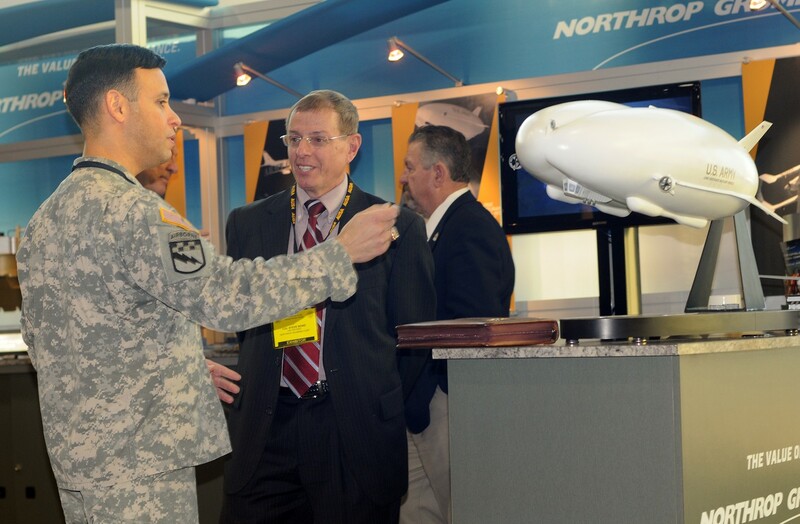 Lt. Col. Hilton Nunez, with Army G-2, talks with Steve Bond of Northrop Grumman about the Long Endurance Multi-Intelligence Vehicle, near a model of the LEMV, during the Association of the United States Army Aviation Symposium and Exposition just outside Washington, D.C., Jan. 12, 2012. While discussing efforts to resource and transform Army aviation during the Association of the United States Army Aviation Symposium and Exposition just outside Washington, D.C., Jan. 12, Lt. Gen. Robert P. Lennox, deputy chief of staff, Army G-8, touched on the future of vertical take-off and landing unmanned aerial systems, or UAS. The general said Army aviation has a "good path" for vertical UAS. "We are using overseas contingency operations dollars and we are hustling systems to theater and we hope to learn from that," Lennox explained. The LEMV, developed by Northrop Grumman, "has got some real promise," the general said. "We will see the value of the persistent stare that that gives us." Other vertical take-off and landing, or VTOL, capabilities the Army is looking at include the Boeing A160 Hummingbird. "It's wonderful not being tied to a long runway," Lennox said. And the platform's long endurance and "pretty good stare capability when teamed with some of the latest sensors, I think it can give us some powerful capabilities." Where such pieces of equipment can go in the Army, or if the Army can even afford them, remains to be seen, he said. "We think it'll help in Afghan significantly." Lt. Gen. William N. Phillips, with the Army Acquisition Corps and the Office of the Assistant Secretary of the Army for Acquisition, Logistics and Technology, said the Army must consider vertical UAS "through an affordability lens. What does this provide to the Army, what capability could it provide and then again how much does it cost?" Lennox said the Kiowa Warrior fleet is now about 35 years old, on average. The rest of the helicopters in Army aviation are about 15-20 years old, and have been "used at incredible rates over the last ten years," he said. The general said Congress and industry have helped reset the fleet. "But we haven't fixed the age of the fleet, and the one that stands out like a sore thumb is the Kiowa Warrior," Lennox explained. "We have to figure out something to do with that." Two options for that aircraft include continuation of the Cockpit And Sensor Upgrade Program along with the Service Life Extension Program. "We can do that now," he said, and "relatively cheaply." That option comes to between $2.9 and $4.1 billion, he said. Another option, which would be to develop a replacement, might run as much as $12 billion. "My challenge for the Army is how do you afford that?" Lennox said. Challenges for Army aviation, Lennox said, also include modernizing an Army fleet that continues to be used at historical rates and will likely continue to be used that way. It will be a challenge to fix existing shortages, Lennox said, like the Kiowa Warrior. One solution might be to develop an Armed Aerial Scout to replace the Kiowa Warrior, he said. Other challenges included: multi-year contracts, modernization of unmanned aerial systems, incrementally improving aircraft, and developing the right aviation force structure. Right now, said Col. Patrick Tierney, director of Army Aviation, the Army's aviation portfolio is in "good health." About seven percent of the Army force is aviation -- though it is an expensive part. There are currently 12 active-component combat aviation brigades, with a 13th coming. There are also eight Reserve-component CABs. The Army has about 3,850 rotary aircraft, about 350 fixed-wing aircraft and more than 5,000 vehicles total of all sizes among its unmanned aerial systems. Phillips said the Army has experienced "exponential growth in UAVs," and the growth, he said, has been successful. "The ground brigade commanders, battalion commanders, company commanders -- have learned how to use UAVs in the most extraordinary ways, to extend their ability to achieve a situational awareness on the battlefield." The Army's fiscal year 2012 investment portfolio includes $2 billion for utility helicopters, including variants of the UH-60 Black Hawk; about $700 million for UAS; over $1 billion for attack helicopters and about $1.5 billion for the CH-47 Chinook. The Army expects to buy about 68 UH-60 Black Hawk variants in the next year, 47 CH-47 Chinooks, 19 Block III Apaches, and 39 of the light utility helicopters. There's "considerable investment in FY12, and it's going to pay off for us," Lennox said.